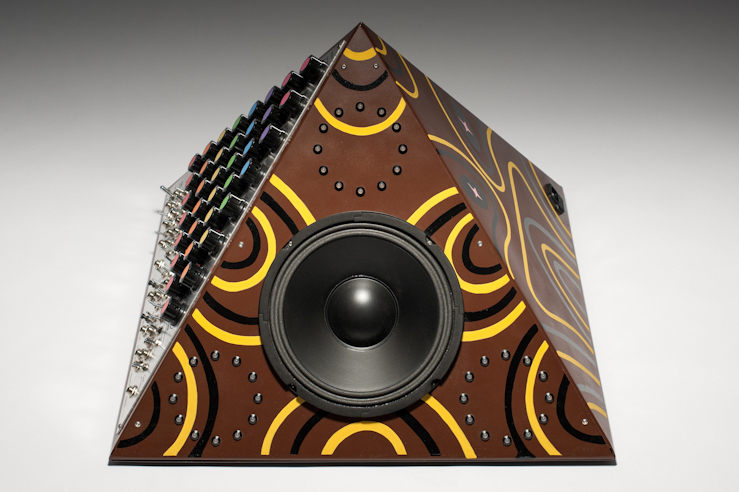 Another collaboration with Pete Fowler - two pyramid-shaped analogue synthesisers with hand painted casings. They began as part of an animated music video that Pete made for The Horrors, and then afterwards Richard Russell (XL Recordings) decided to commission a real life version. 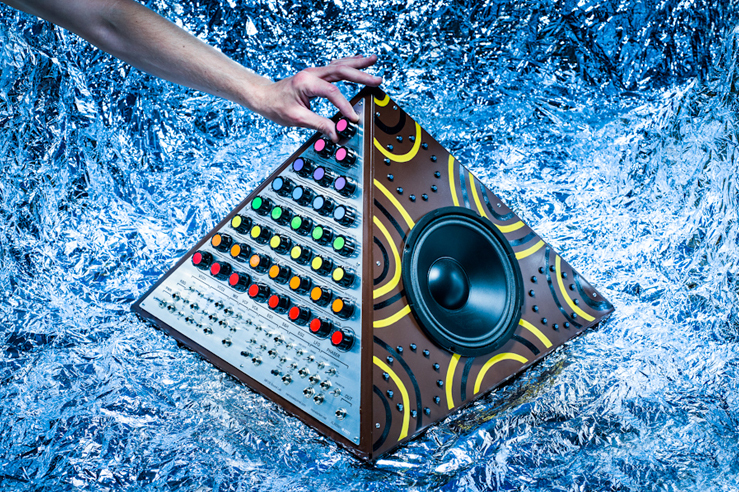 It was decided to make two synths in the end, one for Richard and one for The Horrors to use. They each have a catalog number, "XLRD001 001" and "XLRD001 002". 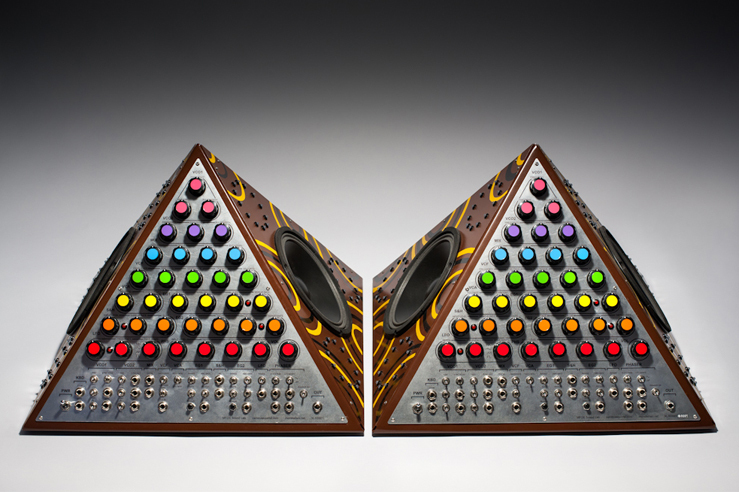 Each synth contains a Sound Lab mark II, built from a circuit board sold by Music From Outer Space. 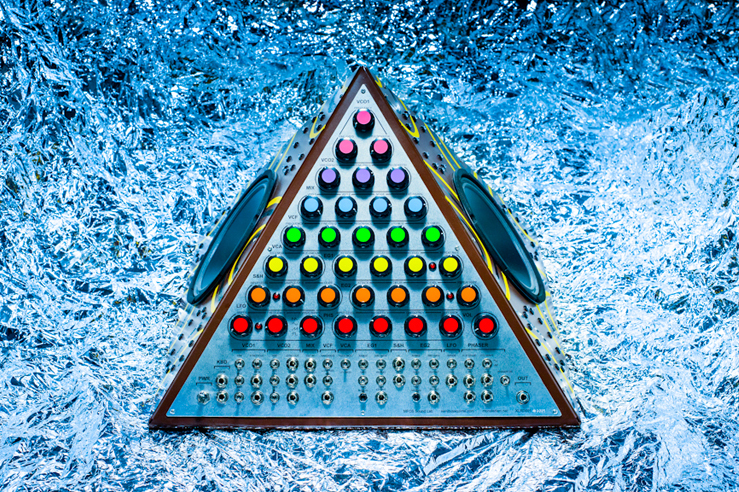 This provides each synth with two very stable VCOs, a state variable VCF, two envelope generators, VCA, LFO, patchable sample and hold, white noise generator and an audio mixer. 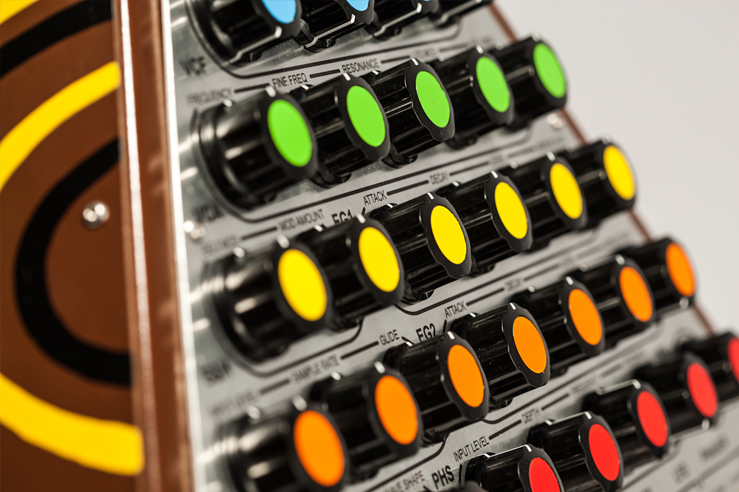 There are plenty of switches and sockets for creative signal routing, and external inputs to process your microphone, guitar or electric ocarina. 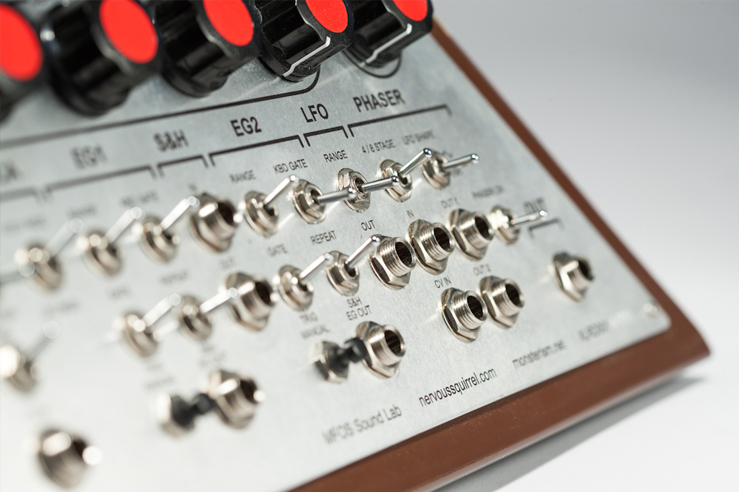 Control voltage inputs allow other synths and sequencers to control different parameters. 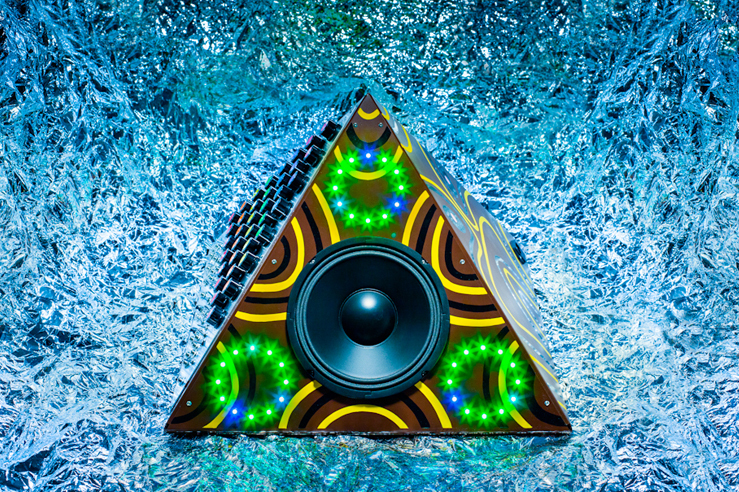 Each pyramid also has a MFOS 8-stage phaser, built in speakers and 72 colour changing LEDs. 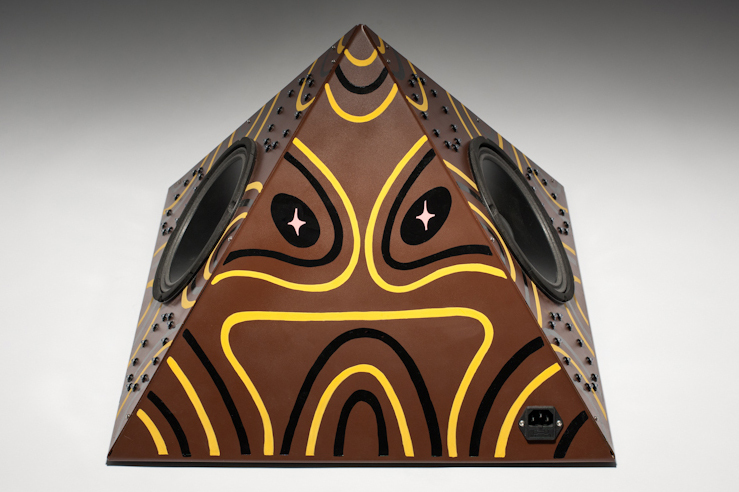 As well as designing the original concept and overseeing the creative development of the synths, Pete hand painted the casing artwork, including a subtly different spooky face on one side of each unit. It's always a pleasure working with Pete, with whom conversational tangents can cover a wide variety of subjects, from talking crows to boat building. Last year we worked on the electronic Van Orlax project, which was also a lot of fun. 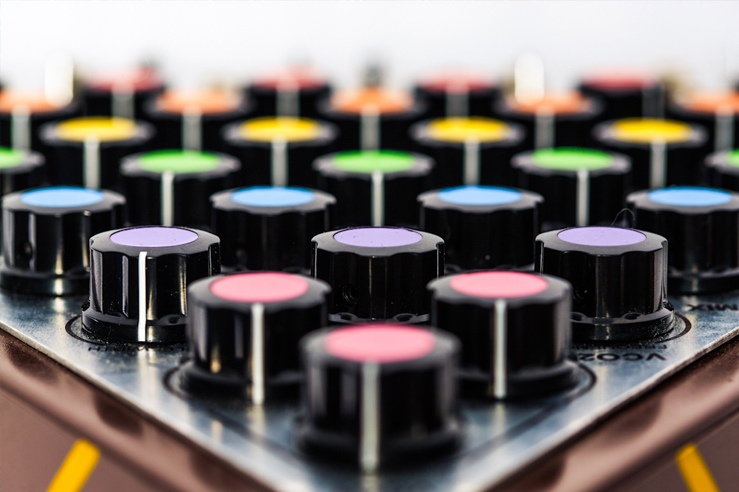 If you would like to commission a synthesiser or musical instrument please get in touch! Email dave [at] this website.